You can see it outside during the day, feel it as you take a breathe of air, as your outdoor visibility decreases and your skin starts to itch your mind may ponder about its potentially hazardous effects on your body. This hazy smoke descends along our roads, into our homes and into our skin, it is smog and it is getting worse by the year. Air pollution in urban areas is most often caused by traffic produced automobile exhaust fumes (especially from diesel engines) burning wood, coal, and cigarette smoke. These tiny particles released into our atmosphere are readily absorbed through our skin (carbon monoxide, nitrogen dioxide, lead, sulfur dioxide, and polycyclic aromatic hydrocarbons) and can reduce the effects of shorter wavelength UVR and significant reductions in UV irradiance have been observed in polluted areas. Although human skin acts as a biological shield against pro-oxidative chemical and physical air pollutants, the prolonged or repetitive exposure to high levels of these pollutants may have profound negative effects on our skin. Air pollutants can erode the ozone layer, allowing ultraviolet radiation from the sun to come through the upper layer of the atmosphere and increase our exposure to harmful pollutants. This unwanted exposure may lead to an increased incidence of skin cancer and other unwanted health and cosmetic effects such as dryness, premature skin aging, spots, wrinkles, rashes, atopic dermatitis, eczema, psoriasis and acne [source: American Academy of Dermatology]. Ozone in the troposphere is a big factor in smog – when sun rays reach smog, they deteriorate into free radicals spreading through our environment entering our bodies and slowly destroy our cells and their protective layers. In addition to increasing the risk for Alzheimer’s, Parkinson’s and skin cancer, free radical damage is also associated with premature aging due to reduced oxygen supply to the skin causing wrinkles and loss of elasticity. “Smog is not a problem that is limited to China or India – we have it in Europe, anywhere with large urban areas including most large cities in Poland. Europe is so densely populated and the particles are being distributed so easily that it is very difficult to escape from the problem. Recently we have seen accelerated skin ageing more often in our patients” – say Dr n. med. Alexander Witkowski. “These pollutants have a very irritating effect and once they get into the skin, they activate multiple pathways of inflammation. 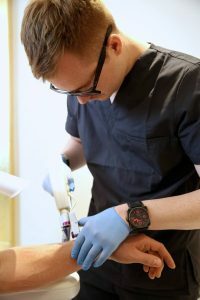 Some pathways activate melanocytes, which abnormally increase pigment and end up giving you unwanted sun spots while other cellular pathways can make blood vessels grow resulting in increased redness and potentially rosacea,” said Łudzik. “Also, if you damage the skin consistantly, it goes into repair mode and activates enzymes which re-absorb damaged collagen. 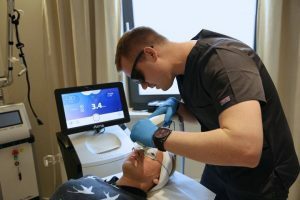 With all the chronic inflammation going on inside our skin, these enzymes can remove more collagen than your skin can produce causing visible fine lines and wrinkles,” said Witkowski. What can you do? Even if you live in a heavily-polluted environment, there are things you can do to help keep your skin protected against the harmful effects of smog. Develop a good skincare routine that includes using moisturizers and sunscreen with minimum SPF 50+ prior to leaving home. Products that help repair the skin barrier, by delivering the pre-cursor lipids the cells need, are beneficial, as are ones that reduce inflammation. Consistent use of skin barriers (such as aloe vera) and dermatologist recommended skin care products containing antioxidants can also help. Recent studies have also shown niacinamide (vitamin B3) to be effective in counteracting some of the damaging effects and this may become more popular in the future. The number one recommendation for our patients is prevention and maintenance, stop it before it starts. If you are already seeing the effects of pollution and early ageing there are a variety of tools in the dermatologists armory to reverse these effects and we recommend to consult your dermatologist for the best possible treatments for harmful and visible effects of pollution.